Sam Jenkins ’19 researches for his AP US History paper on John D. Rockefeller and Andrew Carnegie. 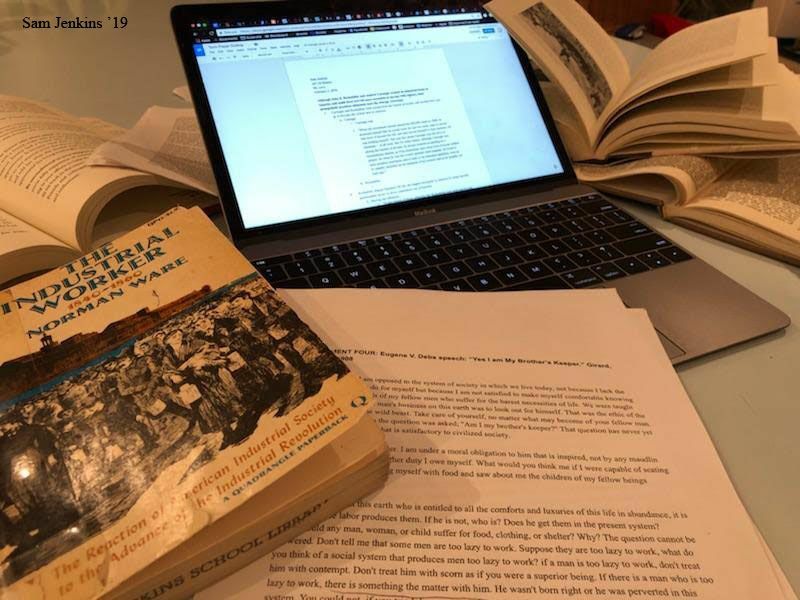 Writing the research paper, a seven- to twenty-fve page paper on one specifc topic, is a hallmark of Hopkins’ high school history classes and a rite of passage. There’s nothing quite like the research paper when it comes to showcasing the individuality of Hopkins students. Research papers allow history students to focus on a narrow, hand selected topic to craft a persuasive, thoroughly researched argument. Students are encouraged to utilize skills such as time management and self motivation, while diving into a personally engaging topic. When talking about why she chose this topic, Doolittle said, “I chose the science fiction one because I was reading Childhood’s End, by Arthur C. Clarke, a famous golden age science fiction novelist, and I thought since it was ACIII I could write about whatever I want. In order to make that a paper, I decided to focus on nuclear war.” Doolittle’s observation reveals that as one progresses through the Hopkins history sequence, the scope of research papers widens and students can truly choose to write about anything historical that interests them.